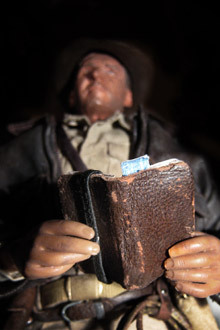 what is possible with one-sixth scale figures. 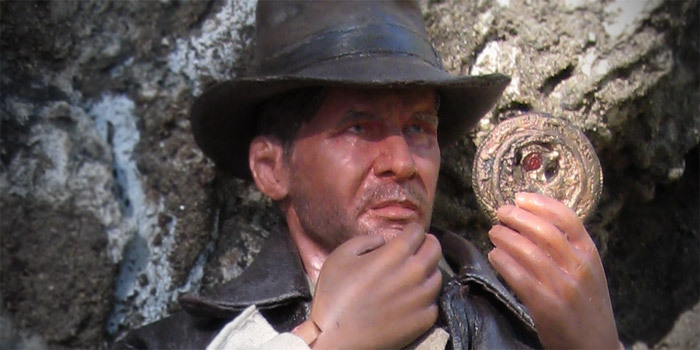 After seeing the fabulous headsculpt of Harrison Ford by Lonnie Hale, I knew I had the perfect start for this Indy. I slowly began assembling parts from all different figures often replacing and upgrading things. 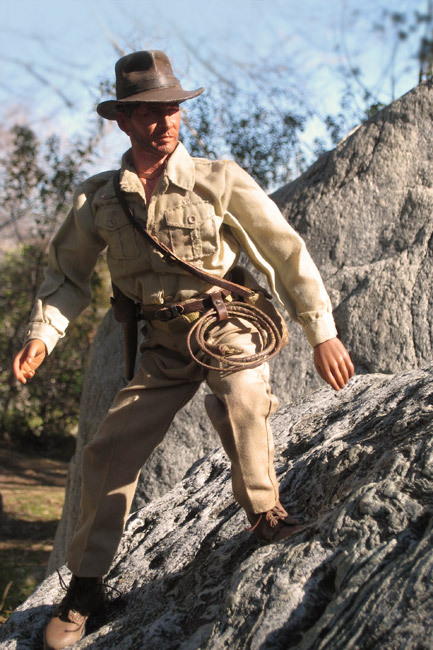 I have 4 or 5 different Indiana Jones style shirts before selecting the one that had the look I wanted for this figure. While in school, I had a packaging project and I thought this would be the perfect compliment for an action figure like this. The deadline of the project also gave me a lot of motivation to finish this figure! 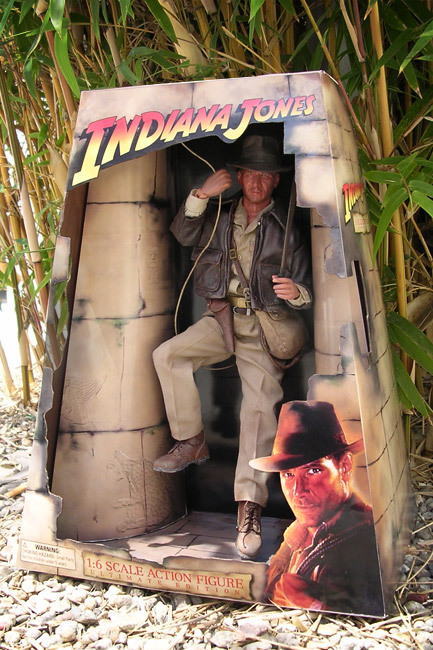 Inside temple-like box, Indy is suspended on a rope between two pillars with a machete in hand ready to ward off his foes and capture another prize for archeology. Part of the project also involved related packaging, in this case, accessory sets. 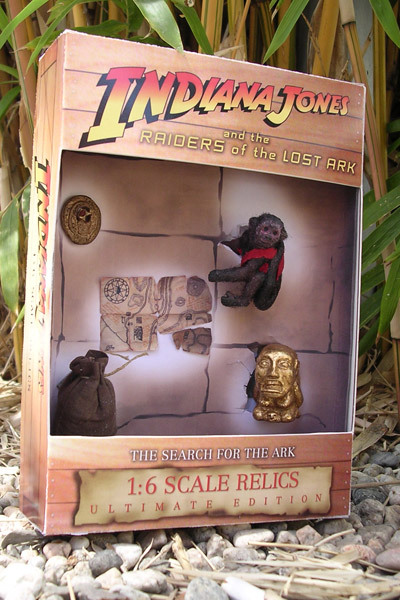 A few accessories I made for Raiders of the Lost Ark are: the Chachapoyan temple map, a sand bag, the Fertility Idol, the mischievous monkey (from an Ultimate Soldier Navy SEAL figure), and the bronze headpiece to the staff of Ra. 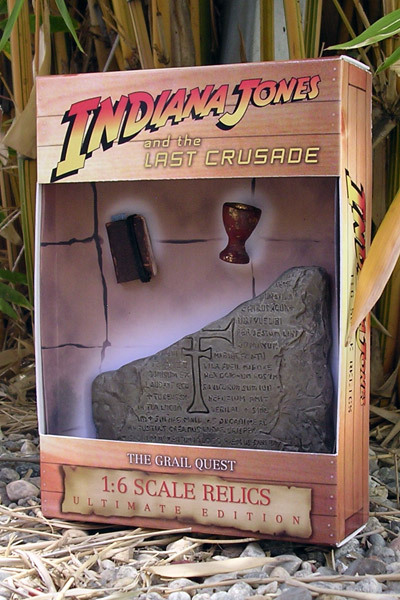 For The Last Crusade accessory set I made the grail tablet, Henry Jones' Grail diary, and the Holy Grail. 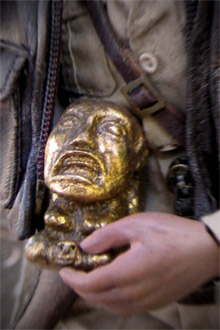 Eventually I would like to make some items from the Temple of Doom as well. 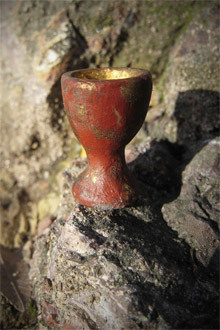 I sculpted the grail, tablet, headpiece, and the golden idol despite them all being available on the aftermarket. I felt the existing golden idol was too small and it also gave me a chance to try out something new. 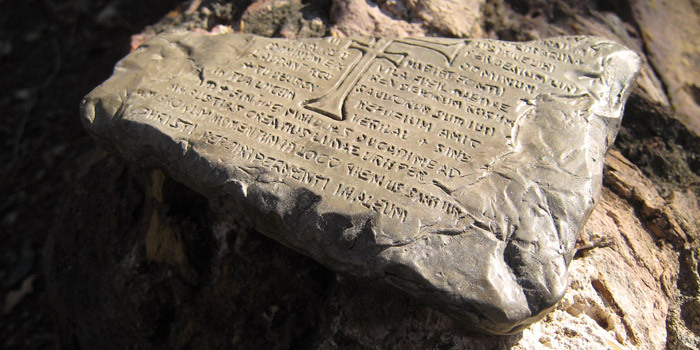 I did a lot of research, checking the movies frame by frame and also looking at examples of props and replicas. It took a few tries to get each piece to where I was satisfied with them. 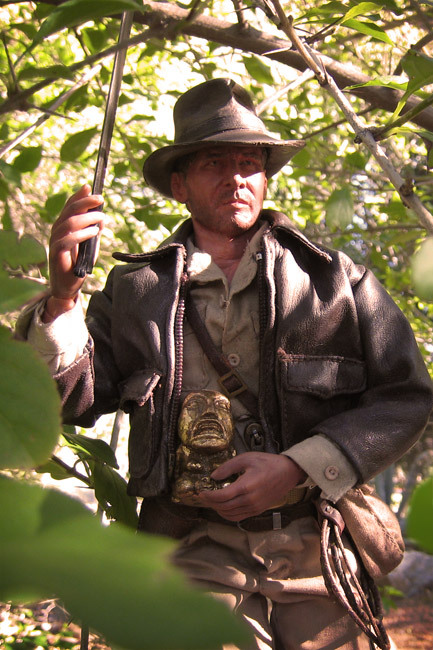 With the Chachapoyan Fertility Idol once more, Indy cuts a path though the dense Peruvian jungle. 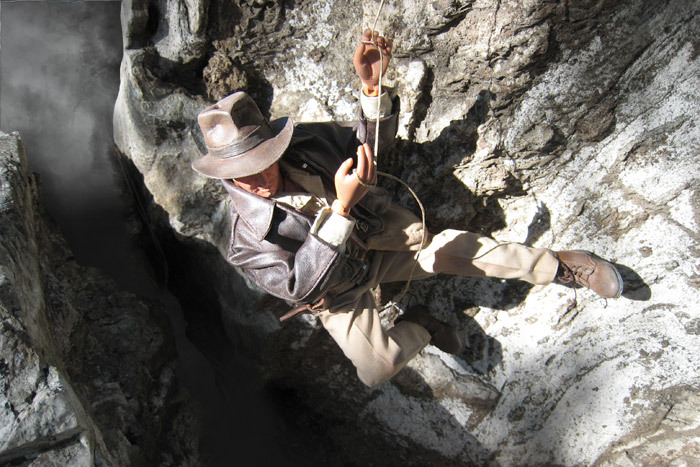 Indiana Jones keeps danger at whips length. Bag: Sideshow French M2 gas-mask bag, added leather strap. This is not film accurate but I felt this bag had the perfect shape for an adventurer. Gun: I chose a Dragon Enfield Revolver but I think this is relatively unimportant. 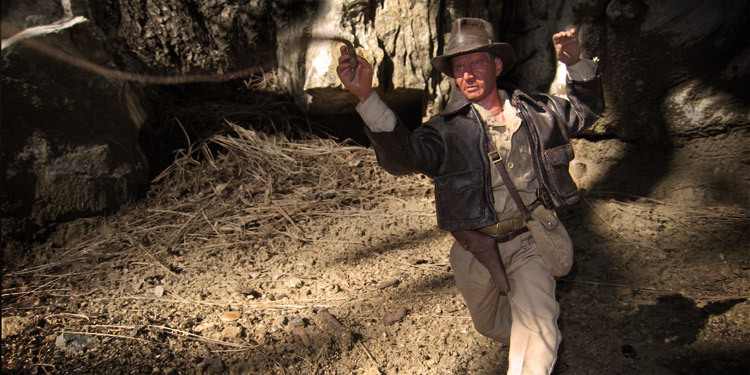 Indiana Jones seems to go though guns like they were candy. Pants: They are from a Dragon WWII US figure, I chose them for their color when compared to the shirt and jacket. Shoes: Dragon in Dreams George Puller, they not 100% film accurate but they match the character very well. 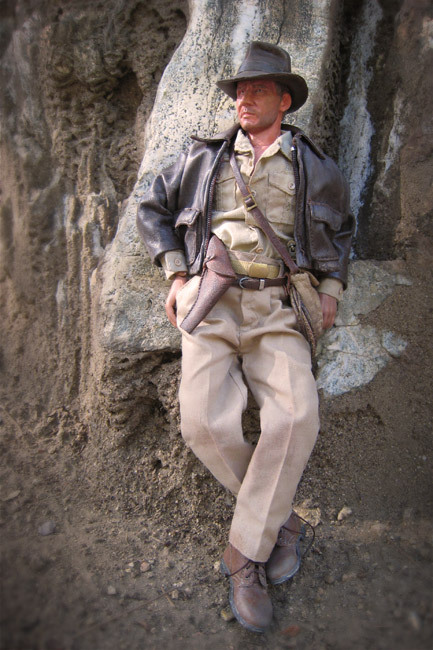 It is important to point out Indiana Jones' costume varies slightly from movie to movie. You make like the design of a particular sequence or photograph and I would suggest starting from there. It was great fun putting this figure and the packaging together. The box was a great challenge, getting two columns inside of a sloping container with enough room for a figure was no small feat. I am grateful for my friends for their knowledge and insight into helping me flesh out the mechanics of the packaging and gracious encouragement. A big thank you goes out to Calvin whom demonstrated and explained existing packaging ideas and also Nan and Tung who provided me with all the current action figure packaging I could handle. 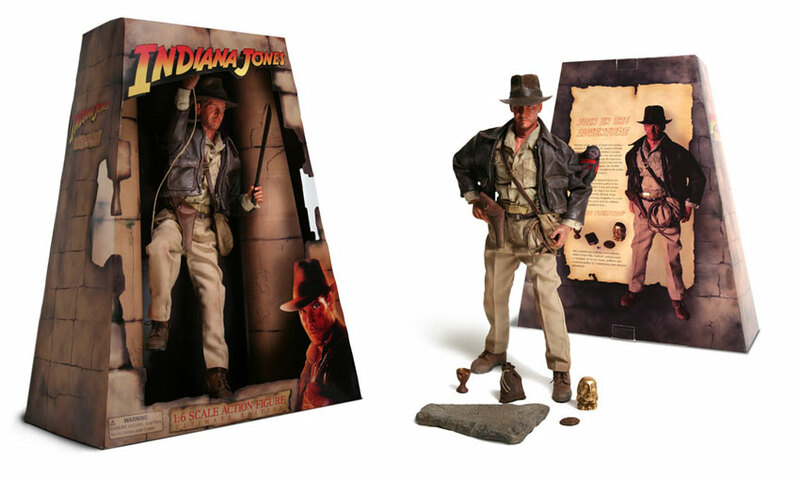 If you choose the quest for your own custom Indy, may you find as good of fortune.